Harsh winter weather or blistering summer asphalt can make walking your dog a challenge. At the first hint of an approaching snowfall, the salt and cinder trucks are on the move. Homeowners and businesses stock up on rock salts and ice melts to make walking less treacherous. Keeping this in mind when you head out for those daily walks with your dog, be sure to protect those paws from the salts, ice and grit. 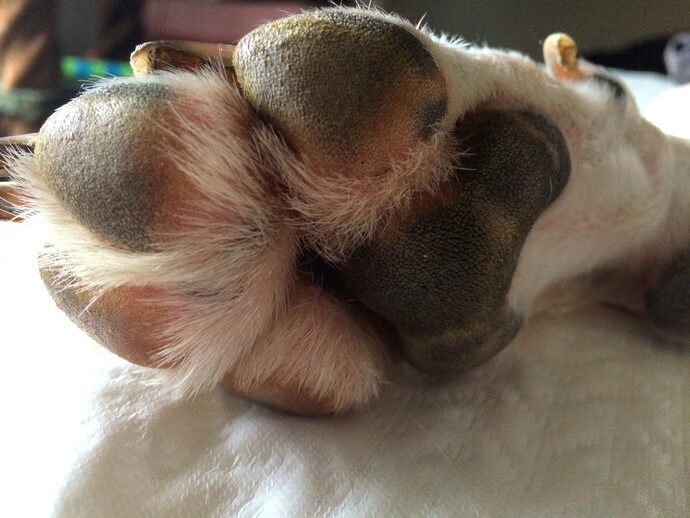 Ice and snow balls can develop under the nails of dogs, especially on those who have fur between the toe pads. These harden and can make walking painful. Rock salts and ice melts lower the freezing point of water, so it prevents the ice from forming. When spread on ice already on the ground, it breaks it up and makes it melt. When the salt penetrates the ice it forms a solution of salt and water called brine. Brine has a lower freezing point than water so the ice begins to melt. The problem with all these melts is that they can harm our pets. Dogs and cats pick up these salts on their paws which can cause internal and external problems. The pet either licks at the salts that stick to foot pads or once inside the salts melt and then when the pet licks at their feet they can suffer burns to their mouths and/or digestive systems. Those salts can heat up to 175 degrees once they start melting. Paw Waxes are a combination of beeswax, herbal oils, and excellent moisturizing oils such as coconut oil and shea butter. Plantain and Calendula are well known in the herbal world for their healing properties for skin conditions and wounds. Etsy does not allow in depth details on plant properties in terms of healing, therefore if you want more information you can either do your own search or message me. Olive oil is skin nourishing in itself and is excellent as a carrier oil to draw out plant properties. Avocado pulp produces a rich, penetrating oil, amazingly beneficial as a moisturizer. Coconut oil is very popular for its hydrating benefits and offers anti-bacterial properties. Shea butter is a heavy butter that once it penetrates is very therapeutic for damaged skin and helps retain moisture. Beeswax thickens everything into a solid and when applied, forms a protective barrier. Just turn the dial on the applicator to expose a bit of the paw wax. Rub over the bottoms of your dog's feet before going out into the weather. The wax should help protect the paw pads from the elements and prevent ice balls or grit from sticking to the pads of the feet. There is nothing in this blend that is harmful to your pet, so it's no big deal when they lick their feet. 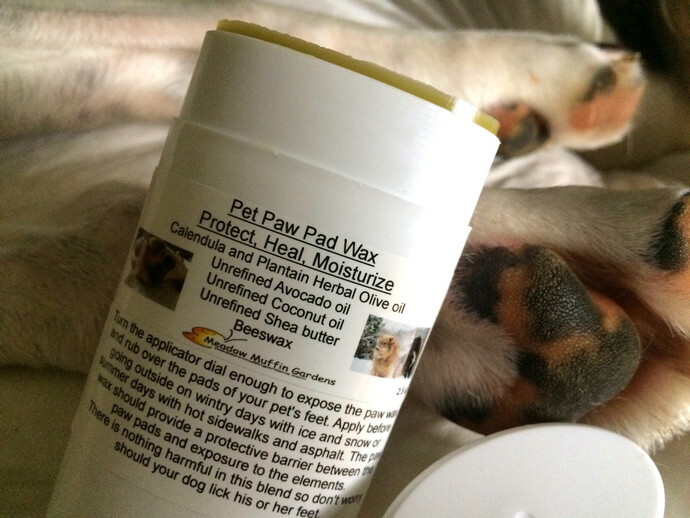 This paw wax can also be used to protect tender noses. The heat of summer has it's own troubles for our pet's paws. Apply the wax in the summer as well to help protect from hot sidewalks and asphalt surfaces. Remember to check those surfaces with the palm of your hand. If it is too hot to hold your hand there, then it is too hot for a pet's feet as well. All the ingredients in this blend are excellent for healing and moisturizing. It could also be used like you would a salve to help heal skin issues, rashes, cuts and scrapes.